We are looking forward to ensure you a pleasant stay at Novotel Leuven Centrum. The beautiful City Centre of Leuven is easy to access by foot. Enjoy our modern and spacious rooms with free WIFI. Looking for insider tips? Ask our reception team! At Novotel Leuven Centrum you will quickly feel at home in our spacious rooms. The hotel is just a 10-minute walk from the train station. The historical city center of Leuven is a 15-minute walk from the hotel: visit gothic St. Peter's Church and the various museums before you head back to the hotel to enjoy local dishes and Belgium beers in the Gourmet Bar. Whether you are organizing a meeting or a reception, the six modular meeting rooms and the restaurant will ensure your events are a success. The hotel is the ideal base to explore the beautiful historical city center of Leuven. Go back in time by visiting the Town Hall, Old market Square and Leuven's University. The medieval city center is within 15 minutes from the hotel. Leuven has a lot to offer, next to the historical buildings it is recommended to visit the M - Museum Leuven, which houses a great art collection. Experience local specialties at one of the many bars and restaurants of the city. 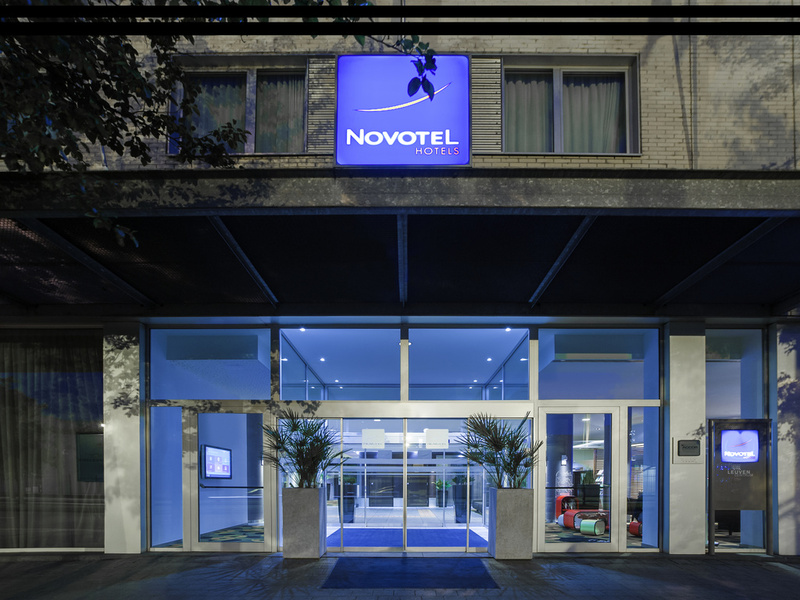 Novotel Leuven Centrum is easily accessible, both by car and public transport. The hotel is within walking distance to the train station and is located just 5 minutes from the A2/E314 highway. Spacious, contemporary in design, and adaptable describes the rooms at Novotel Leuven Centrum. The hotel room is truly a place for living and perfect for all your needs. Whether you choose a superior or executive room, all the rooms offer a welcoming and modern atmosphere. The rooms are equipped with air conditioning, telephone, safe, TV, minibar and free WIFI. Gourmet Bar offers local and international cuisine that is simple and authentic in a relaxed atmosphere. Whether you want to eat or just have a drink, we are pleased to welcome you every day until 1AM. Have a drink or quick bite to eat in our modern and cozy bar. Whether you choose an appetizer or a snack, don't forget to try one of our traditional Belgian beers. The bartender will be happy to switch the TV over so you don't miss your favorite sport! With the exception that the room wasn't made up on the second day, the hotel would have been excellent. This was even more bothersome, as the pillow case had thorn over night and wasn't replaced. Since I only returned late after midnight, I didn't seek for a solution at that moment. For the rest a decent breakfast and friendly service. I stayed for a week, while attending a tech conference at IMEC in Leuven. good location good breakfast room clean but very warm...drain shower should be checked as water flowing very very slowly away.. The room was nice and spacious. The staff was super friendly and my room was always clean. No complaints at all. Stayed 1 night. Nice room - floor 5. Breakfast adequate, much choice, new coffee machines with good cappucinno. On arrival received a welcome gift....water and cookies. Good rooms, great service, very good foods and beers, and as I'm a trumpeter I was given a meeting room where I could practice! That's everything, is it not? The homepage to book rooms is not user friendly. To cumbersome to book, also too much complicated to check in in advance. I had finally to call the hotel and book. Room was clean and neat with good amenities and my western room had a great overlook of the Stella Artois brewery. Close to great eating amidst a picturesque bit of Flanders. Nice comfortable room. Good breakfast. But a couple of annoying points. Staff was helpful and very cordial. The experience was mediocre Same breakfast buffet day after day - when condiments were empty is was days before they were refilled. Exercise room was neglected - broken machine, no water. Very friendly reception, great atmosphere and congeniality. Several time at this Hotel, quality always very good. Breakfast complete, confortable rooms and beds. It was good and comfortable.